The entire ship follows her like a slave. "A tall island, with jagged peaks..."
Jules Sébastien César Dumont d'Urville, born in Normandy, France, in 1790, commenced his career as a specialist in botany and linguistics. However, on terminating his studies at the Lycée de Caen, he joined the Navy. In 1807 he served aboard the "Aquilon" as novice, until on becoming "aspirant" in 1809 he served on the "Amazone" D'Urville was eventually promoted as "Lieutenant de Vasseau" in 1821. In 1821 Louis Isadore Duperrey and Dumont d'Urville reunited to propose a scientific research expedition. This was approved, and at the same time Duperrey received orders to look into the eventuality of establishing a French settlement in Western Australia. The British had not yet annexed this area. At Port Jackson, in Australia, the British had established a convict colony, and the French were considering the same idea. France had also become very aware of the need for a base in the Pacific, and it was with these projects in mind that the Coquille, a 380 ton 12 gun corvette, left Toulon in August 1823, with Duperrey in Command and D'Urville as Second in Command. The Coquille eventually arrived in Port Jackson on 17th January 1824, Shortly after, the French left Port Jackson, bound for New Zealand. They had taken 5 passengers onboard : George Clark, a missionary, with his wife and baby, and also two Māori returning home, Taifana and Hapai. The coastline of New Zealand came into view on 2nd April 1824, and the following day the Coquille laid anchor in the Bay of Islands. Many Māori came out to greet the ship, and the day after three chiefs arrived to greet the shop : Hongi, Te Tuhi and Pomare. Pomare, a Nga Puhi chief, was the personal protector of the British missionary Thomas Kendall. After a short stay collecting botanic specimens, trading and meeting with the local Māori, the Coquille left the Bay of Islands on 17th April, arriving in Marseille on 24th January 1825. During the stay in the Bay of Islands, d'Urville was also able to gather much invaluable information about the Māori and their lifestyle. Hoping for his own exploration voyage, d'Urville presented a proposition to the Minister of Marine shortly after the return of the Coquille to France. The proposition was approved before the end of the year, and the Coquille began preparations for a further voyage. She was renamed "Astrolabe", and left Toulon on 25th April 1826, this time under the Command of d'Urville. On 7th October, the Astrolabe laid anchor in King George Sound, later to move on to Port Jackson, where the French remained until 19th December. The Astrolabe then left Australian waters, and headed for New Zealand. D'Urville considered that Cooks charters of New Zealand were incomplete, and he intended establishing a complete and detailed charter of the New Zealand coastline. He planned charting the whole of the west coast of the South Island, sailing through the Cook Strait, to continue charting the totality of the east coast of the North Island. "Māori on board Astrolabe performing dance, French officer at right; at Tolaga Bay"
On his route, d'Urville named a small inlet "Croisilles Bay", in memory of his mother. He also discovered an island near Tasman Bay, and which his officers named d'Urville Island in his honour. The particular channel where d'Urville Island was discovered was named "Passe des Français", and is today still referred to by it's English equivalent of "French Pass". D'Urville spent approximately three months charting the northern shores of the South Island, including the east coast of the North Island up to North Cape. During this time he once again collected many botanical specimens. On 12th March 1827 the Astrolabe laid anchor in the Bay of Islands, where the ship remained for a week taking on fresh supplies. On leaving New Zealand, and after spending much time navigating the surrounding Pacific Islands, the Astrolabe eventually returned to Marseille on 25th March 1829, with the most complete charter of New Zealand since that of Captain Cook. The third time Dumont d'Urville returned to New Zealand was the result of his proposition to the French naval authorities for a second circumnavigation in the Pacific. D'Urville's expedition this time would involve two ships, the Astrolabe and the Zelée. The ships set sail on 7th September 1837, stopping off at Staten Landt before passing by Le Maire Strait. D'Urville had also received orders to navigate the Antarctica area. It was not long before the Astrolabe and the Zelée found themselves in the icefields of the south, near Clarence Island. Bad weather, ice fields, fog and snow eventually obliged d'Urville to turn from the Antarctica, before the end of it's short summer, and make for the South Orkneys, where the ships laid anchor at Saddle Island. After long navigation around the Pacific Islands, calling in to various ports such as Guam, Tahiti, Tonga and Java, the French arrived at New Holland, (Australia) where the ships laid anchor on 27 February 1839. During the months which followed, d'Urville navigated around the islands of Indonesia, waiting for the Antarctic summer. Mid January 1840, the Astolabe was back in Arctic waters once again. D'Urville raised the French flag over land which he took in the name of the King of France, and which he named Terre Adèlie, after his wife Adèle. This narrow area of land runs to the South Pole, and is still a base for French scientists today. On leaving the Antarctic on 1st February 1840, the French headed Hobart, in order to pick up the sick who had been left behind to recuperate, and also to take on fresh supplies. On leaving Hobart for New Zealand, Stewart Island was sighted on 23rd March 1840. A few days later the ships arrived at Hooper's Inlet, on the Otago peninsula. Here they met with the crew of the French whaler "Le Havre", where they learnt that many French whalers were leaving the Eastern Pacific for the more lucrative whaling trade in New Zealand and Australian waters. On continuing up the coast, the ships arrived at Akaroa, where they remained a short time with the small French colony established there. Four French whalers were already stationed in Akaroa. D'Urville continued north, to arrive at Kororareka on 26th April, where he discovered with surprise that the British had just annexed the North Island. D'Urville arrived back in Toulon on 6th November 1840. On 8th May 1842, Jules Sébastien César Dumont d'Urville's life came to an untimely end when he was killed in a train accident, near Paris. 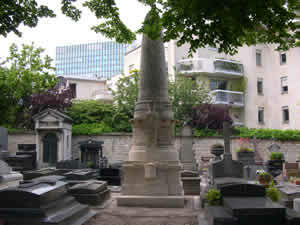 The memorial to Dumont d'Urville, in the Montparnasse cemetery, Paris. The maps chartered by D'Urville were the first major ones after those of James Cook. In New Zealand, D'Urville Island and the D'Urville River are both named after this French explorer.